Fans of Keri Arthur, Chloe Neill and Kim Harrison will not want to miss this great new series. I loved this book. I couldn't put it down. I started reading it after supper and only put it down to put the kids to bed so that I could have more uninterrupted time with Harry and her friends. What a great narrator Harry is. I loved her voice. She's a bit innocent but still handles herself even when she gets into trouble, even when she's surrounded by a bunch of alpha males. I love how she went toe to toe with the big bad vampire and won (oh, sorry, spoiler). There is a potential love interest but it's on slow burn, but that's okay. It just makes me want to read more. I can't wait for the next one! Thank you Lisa Emme for sending me an ARC in exchange for an honest review! I loved this story! It has all my favorite types of paranormal characters and Lisa has given these characters wonderful personalities! The story has a bit of everything; comedy, love, action and drama. I couldn't put it down and have read it twice already. It was an easy read with a great story line. I didn't want the story to end! I can't wait to read the next book in this series. Harry, the female lead, amused me, although a few times I wanted to smack her upside the head for ignoring some obvious things. I loved that she was loyal and did the right thing even when it landed her into trouble. She didn't cower away from it. Plus, she wasn't in-your-face. Some people feel that making a woman strong means she has to be in-your-face. Ugh. And Nash... well hello. Now there's someone I want to wake up next to. While he was overbearing, he was still surprisingly sweet. And Harry, well, she didn't put up with his nonsense. The world building was decent. It slowly unwrapped without overwhelming or giving major info dumps. I want to learn more about Isaac, the vampire, as well as the Magistrate. Now there was one scary dude. Overall, I enjoyed the story, I loved the characters, and I can't wait to read more. 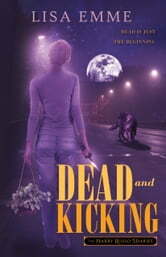 This is a FANTABULOUS Urban Fantasy!!! So the other day I got a random GoodReads message from someone who noted one of her books on my TBR. She offered me a copy for review and I took it because I'm greedy like that. I started the first few pages and then, being a mom, I was unable to pick it up again for several days. I liked what I read and I wanted to finish, but I wasn't so far into the story that I was committed. So when I did get back to it... five star I read the whole thing in one go, I loved her characters and her story line, I was completely engaged with the big bad werewolf, the Queen of Denial Witch, and I appreciated with my whole heart that I didn't notice there were any editing issues. My only complaint was that one plot point came out of left field, but if you are prepared for a complete surprise near the end, then you won't have the same complaint I did. This is straight up UF and could give Kim Harrison a run for her money. The narrator is witty and fun, her friends are great support characters; the back-up cast ranges from insidiabulous to nerdtastic, and makes me look forward to every book in this series. Gimme more! I know, I know. It's release day..sigh...when's the next one out?? ?